With it being the Halloween season, now is a good time to highlight one on the unique items in our digital collections. The work itself is broken up into three sections. 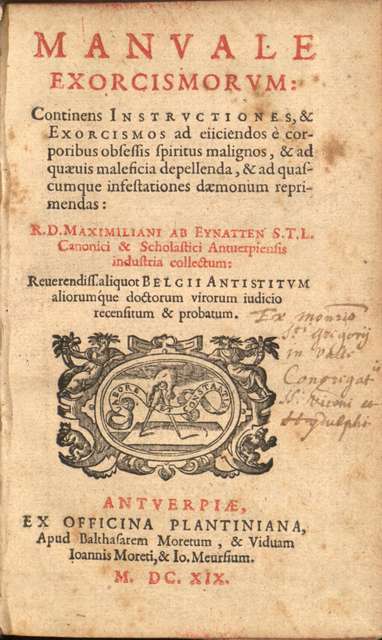 The first part contains general instructions and preparations for exorcisms: things like how to determine if a person is suffering from demonic possession and not from natural diseases, learning about various symbols and their effects, proper time and place for an exorcism, and various precautions to take against demons. The second part details the methods and practices used in an exorcism, including many different prayers, invocations, and solemn oaths, with selected prayers and exorcism methods included from respected authors. Finally, the third part contains methods and practices to expel various kinds of witchcraft or enchantments from both bodies and other objects, including chapters on exorcising dairy products, cereals and other foods (with specific chapters on milk and butter); exorcising a spirit from a home; exorcising witchcraft from your own body and exorcising witchcraft from the bodies of others; remedies against pests, fevers and other natural diseases; and remedies against love potions, amongst others. Though old and written in Latin, the text reads very much like a modern-day field guide, written in a no-nonsense referential manner so that it could be easily used during field work.